When Star Wars Rebels started I heard many people complain about it, as they compared it to The Clone Wars. They had concerns Disney had destroyed the franchise. What was your first impression? My take on it was to wait and see what Dave Filoni, Henry Gilroy, Nicole Dubuc, Simon Kinberg, Greg Weisman, Brent Friedman, Kevin Hopps, Steven Melching, Matt Michnovetz, Charles Murray, Gary Whitta, Bill Wolkoff, and Christopher Yost could write/produce over the seasons. Some came and went, but the story line continued to improve and weave in some of our favorite characters from other Star Wars shows. By the end of Season 4, few would still be complaining about Star Wars Rebels. The story line was captivating. Most of us felt as if the Ghost Crew were part of our own family. We were emotionally involved. On #RebelsNight we would make Star Wars Rebels theme food and eagerly await the next episode. And the last few episodes left most cheeks stained with tears. Who is Sabine Wren? Is she force-sensitive? Sabine Wren is a teenage Mandalorian warrior/artist and explosives expert. She loves to leave her creative mark on many items and Ezra's heart. As a fan of course I'm hoping that Disney continues the story line of Hera, Sabine, Ahsoka, and others in some significant way in the future. 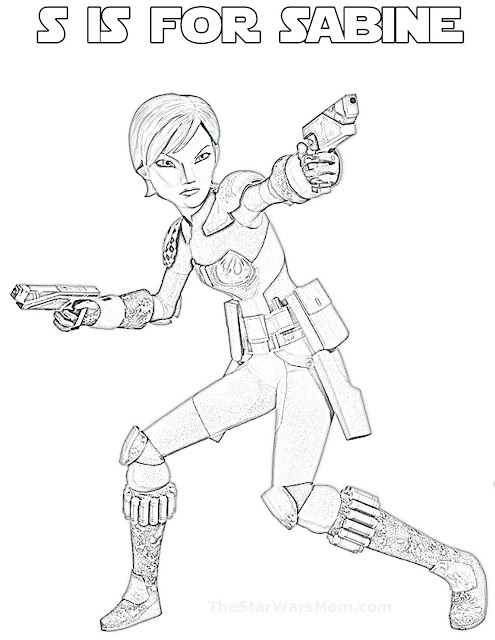 Do you think Sabine is force-sensitive? I don't think it has been determined, but she certainly showed some skills that could lean in that direction. Don't forget to make some of Sabine's Starbird Bars to enjoy while you color her beautifully!